I had a request for how I make fried chicken in the air fryer and was finally able to have the time to take pictures the last time I made it. I love how simple it is to have fried chicken without the mess of a deep fryer. I've actually loved my air fryer for so many things. I purchased my air fryer at Costco last year. The brand is Gourmia and it is a 5 quart fryer. I would not recommend a smaller size. I've been very happy with my Gourmia. 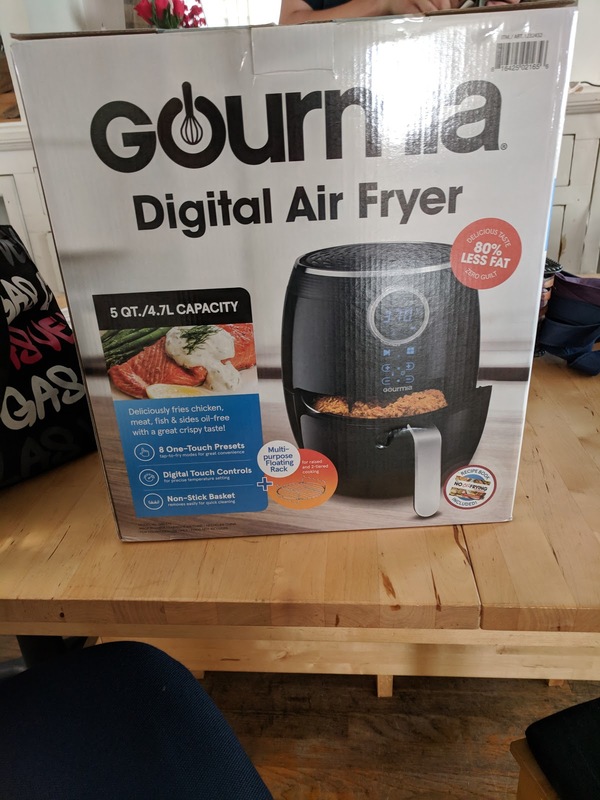 Costco is no longer selling this brand and is selling a Phillips brand air fryer. My son has that one and has been happy with it. Now on to the fried chicken.. 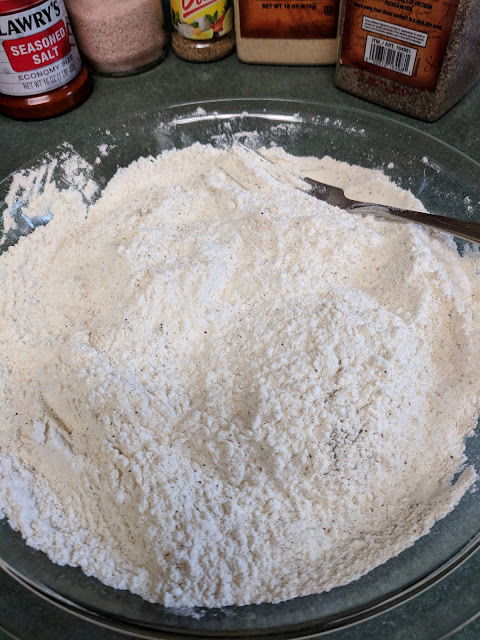 The first thing I did was to mix up the flour that I coat the chicken with. Combine all of this very well. I used a pie plate for the flour mixture. This will be plenty of flour to coat 2#'s of chicken pieces. 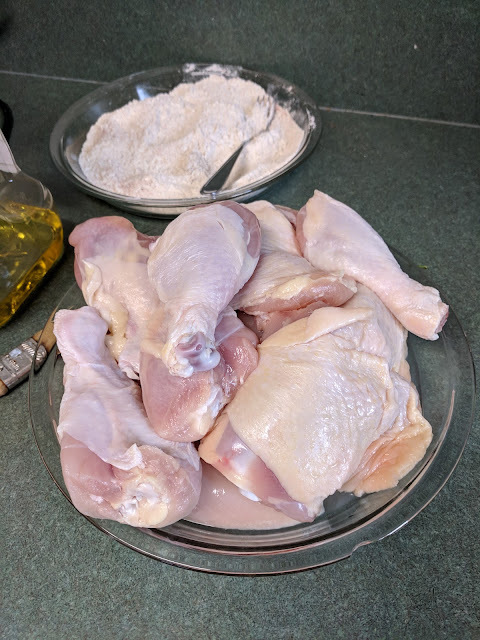 If your only doing 1# of chicken you can cut the recipe in half. Wash 1 to 2#'s of chicken pieces of your choice. 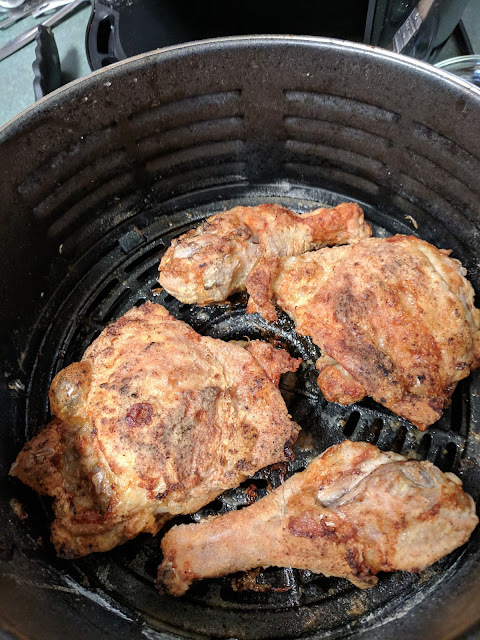 I used chicken thighs and legs. You will want chicken with the bone in and skin on. It makes the most tasty fried chicken, in my opinion. 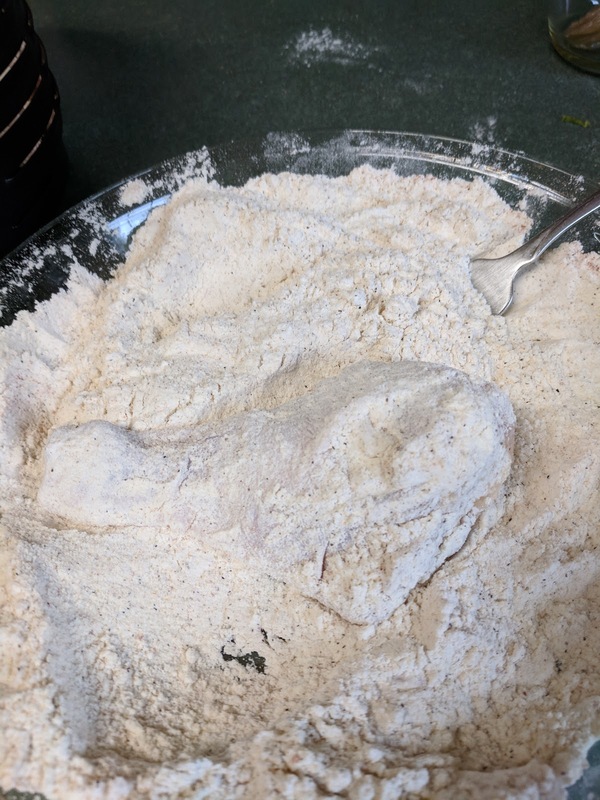 Coat chicken pieces with the flour. 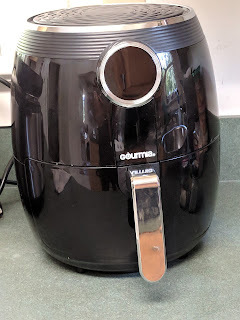 Grease your air fryer. I do not recommend greasing with Pam or any other types of spray on grease. I have read that this will eventually take the coating off of the surface of your air fryer. 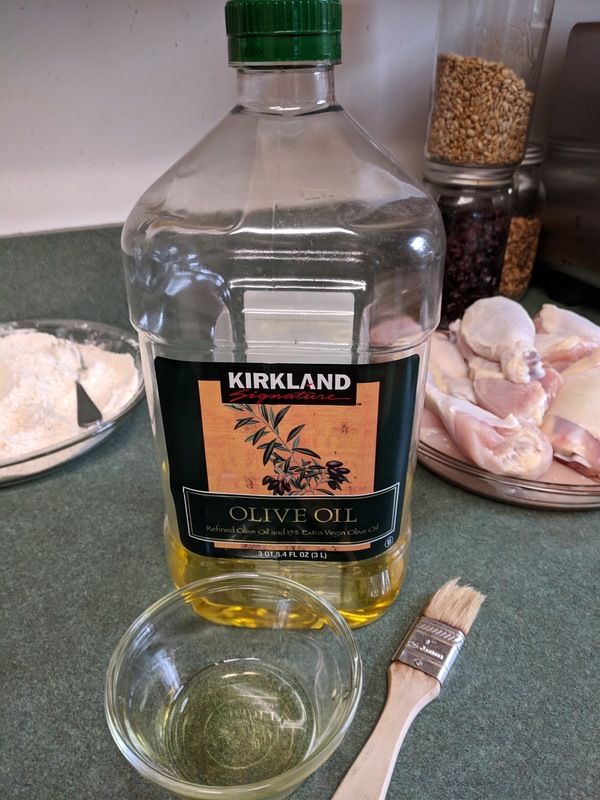 I pour a little oil into a small container and then brush it on the bottom of the air fryer. 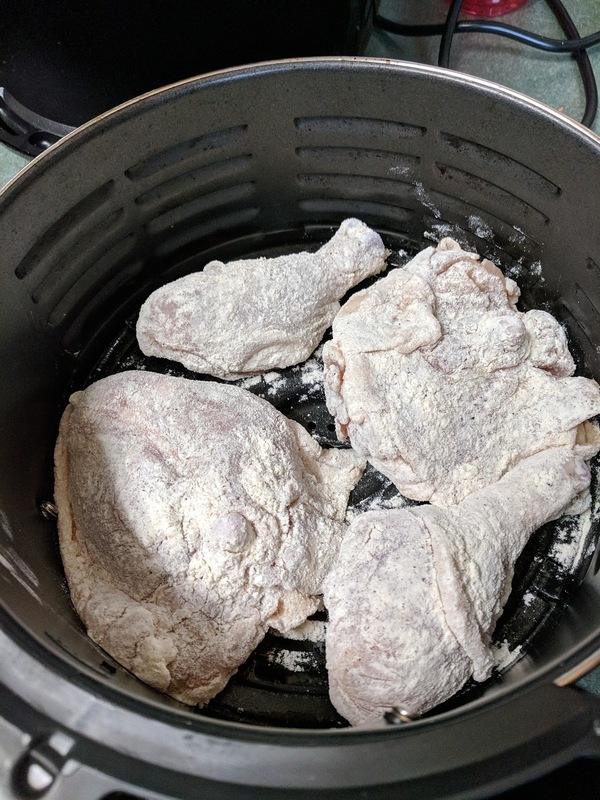 Lay the chicken pieces in the air fryer. You don't want them touching. I did 2#'s of chicken and did the process twice. 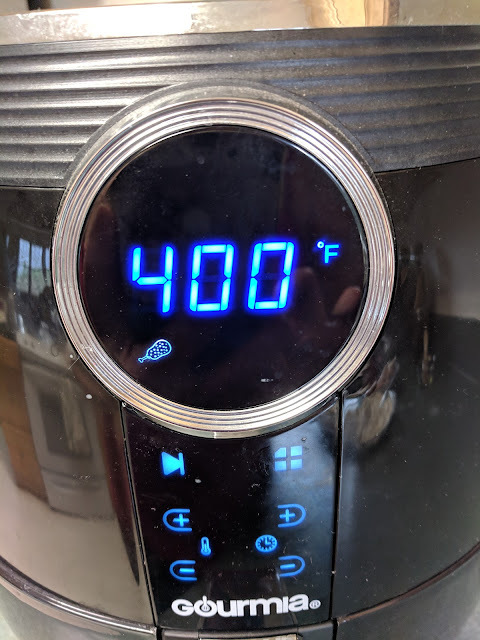 Set your air fryer to 400 and 20 minutes. 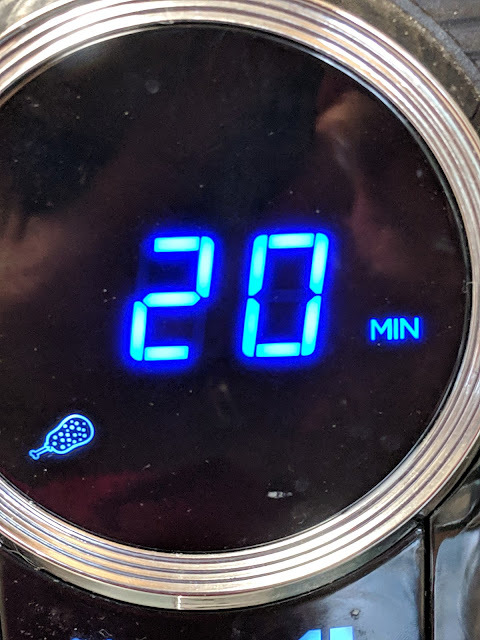 Some air fryers have preset temperatures and times already built in. If yours does, then go by those times. Mine has the preset temps and times so that is what I use. Let the chicken cook for 10 minutes or half the time. Pull it out and flip it over. Insert the chicken back into the fryer and let it finish cooking the remaining 10 minutes. At this point it is always a good idea to use a meat thermometer to verify that the chicken is cooked completely. Insert the meat thermometer into the thickest part, not touching any bone and it should read 165 (or above). 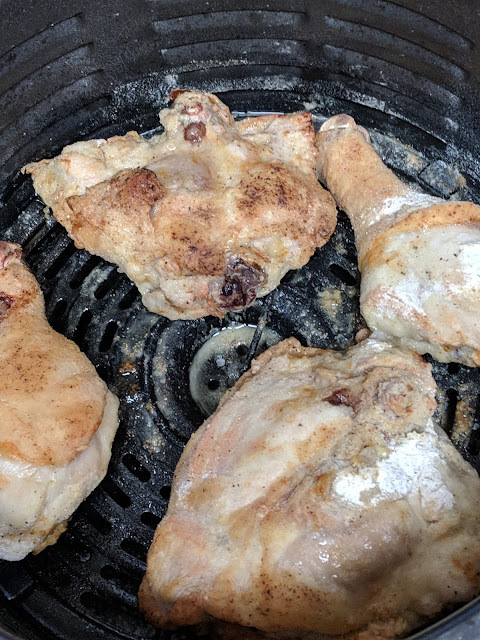 If the chicken is done remove it from the air fryer. This temp and time easily cooked my thighs and legs. If you are using breast pieces it may take a little more time. If you are making 2#'s of chicken repeat the process for the second batch. Hi Dana, I'm not sure how to answer your question. I think it does. The skin is crispy and flavorful. I never make fried chicken because I don't like the oily mess so I don't have a great comparison. But I do know we love it. I do use my air fryer often. It does a fantastic job on roasted veggies. I've done potatoes, sweet potatoes, broccoli, onions & mushrooms. I've roasted garlic to use in other recipes. 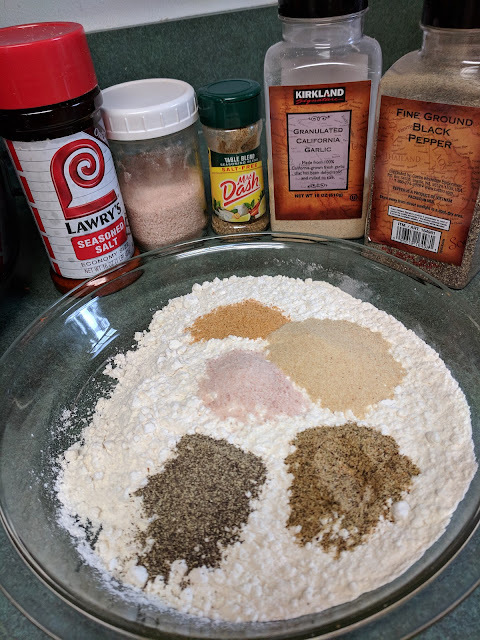 I've done hamburger patties (usually just one so it's not great if you are doing them for a family). My daughter uses hers even more. She's done salmon and pork tenderloin, grilled cheese sandwiches and much more. I've also done frozen french fries and tater tots and now would never do them in the oven again. I hope that helps to answer your questions. Thank you, Crystal. I guess my question was a bit vague. I meant does the air fryer give the chicken a crispy texture. I never make anything fried because of the mess and the calories. But it sounds like an appliance that I would use often! Also I'm glad you said not to go to a smaller size since I was considering that. Please share more recipes sometime. Thanks again! Thank you so much for posting the tutorial. I will be trying this out next week.